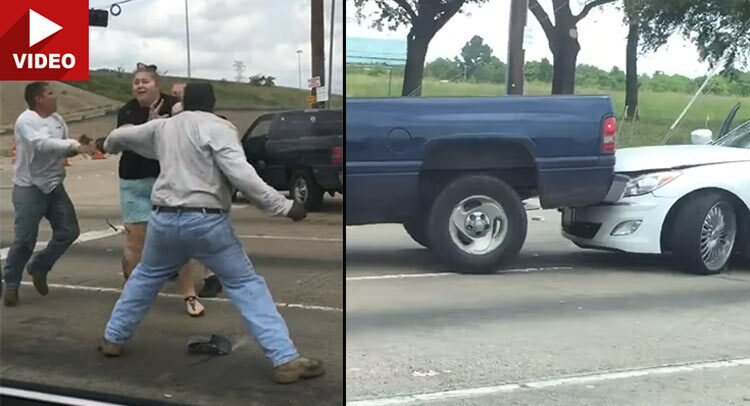 Everything’s bigger in Texas – even road rage incidents. This one happened at a busy intersection near Houston when a brawl erupted between three men and a woman. In the video, the woman got into a verbal argument with the male passenger and driver, while the man in the truck appeared to be trying to break things up. Even though it looked like the episode was over, the situation rapidly escalated into a brawl. “The truck then sped up nearly hitting the woman who was his passenger. She then walked back to the white car and the passenger threw a drink at her and then,” said Dao. The infuriated Hyundai driver and passenger then attacked the man, with the woman screaming and trying to break up the fight, but she ended being punched as well. Far from over, the truck driver reversed and crashed into the Genesis before taking off. The Hyundai apparently went after them, but we don’t see what happened next. The Harris County Sheriff’s Office told reporters that they have not been notified about the incident.